Welcome to another installment of WHAT'S ON NETFLIX?, where we pick out a film or series currently playing on Netflix and review it for the fans. This week's selection is the Oscar winning drama...THE BIG SHORT. The Big Short, directed by Adam McKay, who also directed Step Brothers and Talladega Nights (Yeah, you read that right), is one of the most intellectual films I have seen in a very long time, possibly THE most intellectual film I've ever seen. McKay brings an all star cast to the screen and blows the competition of the Oscar nominated films out of the water. Now, it only won one Oscar, for best adapted screenplay, which is very well deserved and it definitely was a contender for best picture. 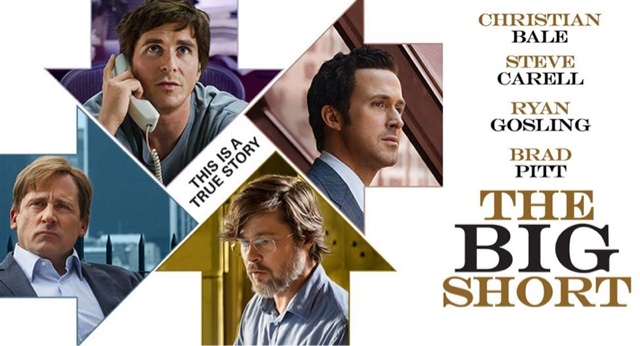 With Christian Bale bringing his multiple personality acting skills back to the big screen, the incredibly talented Ryan Gosling, and the hilarious yet simultaneously emotional Steve Carrel, The Big Short delivers in both laughs and tears. The Big Short takes one of the most complicated and intelligent business styles in the world to the screen and dumbs it down for the average audience. But not in the way that makes us feel like we are dumb. McKay cuts to famous celebrities explaining stock and marketing terminology and other monetary business lingo, and this only adds to the brilliance. The film jumps from so many situations to the other and you do not feel lost for a moment which is astounding for how crazy the cuts and edits are. The performances are wonderful, the editing is very reminiscent of the French New Wave style films. The cinematography is kind've like we are just a spectator at the crazy show. But it helps bring to life the chaos these bankers and investors must have been feeling at the time. I believe I said out loud "Jesus Christ" ten times throughout the film. It delivers jaw dropping truths about the house market collapsing and how the investors were acting and how the banks and the government just "fell asleep at the wheel" while millions of people lost jobs and houses. But it also made me laugh out loud on several occasions. The film delivers a very well known issue and makes it simple for the audience to understand and also makes you laugh at it. The Big Short is a very intelligent film that delivers one of the most clever and hilarious screenplays I have seen in a long time. This film creates an everlasting inspiration in film makers and writers. Labels: Christian Bale, Drama, Movie Reviews, Ryan Gosling, Steve Carell, The Big Short, What's On Netflix?